Derry Mathews won the interim WBA lightweight title with a unanimous points decision over late replacement Tony Luis in Liverpool. Richar Abril lost the belt for twice pulling out with illness, while original replacement Ismael Barroso withdrew after failing to get a visa. Liverpudlian Mathews made the brighter start against his Canadian opponent. Both were deducted a point in the eighth before Mathews won 114-112, 114-112 and 115-112 on the judges' cards. Mathews, who had secured 20 of his 37 previous victories by knockout, utilised his long reach to keep his opponent contained behind the jab in the early stages of the contest. However Luis, 27, made matters difficult for the 31-year-old with his relentless style, landing a good uppercut at the end of the sixth. 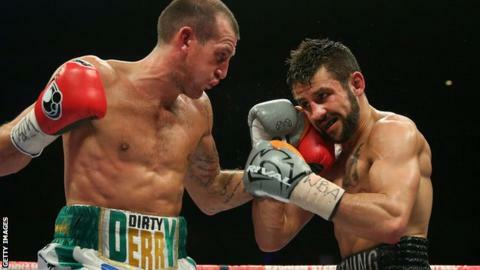 Mathews increasingly favoured the ropes at the Echo Arena and was penalised for a low blow in round eight, while Luis was punished for use of the head. In the closing rounds, the continued ascendency of Luis threatened to change the outcome but former British and Commonwealth champion Mathews was awarded the victory.